I love writing letters in my journal. Most of these letters will probably never be seen by anyone, but I think there's something therapeutic about writing letters. It's also a great way to remember events. This month was so busy, but exciting. I wrote several letters in my journal and I thought it would be fun to share a few with you all. You are one of my favorite months. There are so many events and celebrations like Michael's birthday, Mother's Day, and end of the school year celebrations. Thank you for making the limited edition Molten Chocolate Latte chilled espresso. This drink is amazing and it might just be my new favorite drink. Thank you again so much. That was so incredibly kind of you and it made my day. I love hearing stories about random acts of kindness and it was so cool that I experienced one. I want you to know that I paid it forward. This is such an exciting time! Whether you are graduating high school or college, I just want to say that I am so proud of you all. It might sound a bit weird since I don't know every single high school or college graduate, but it literally makes me so happy when I see someone wearing a cap and gown. Random fact...when I do see someone that is graduating, I make a wish that he or she accomplishes all the goals that they have set for themselves. So graduates...congrats! I hope all your hopes and dreams come true. So I just saw the music video for Girls Like You and it is amazing! I love that there were so many dope women in the video. Watching: Band of Brothers is one of the best war drama miniseries ever made. I watch this miniseries at least once a year. I read the book by Stephen Ambrose and it's such a great read. Reading: I'm currently reading Am I There Yet? by Mari Andrew. Her artwork is amazing. You can check out some of her work here. Listening: Lana del Rey and Barrie-James O'Neill's cover of Summer Wine is amazing! I've also been listening to This is America by Childish Gambino. The music video for this song is incredible. 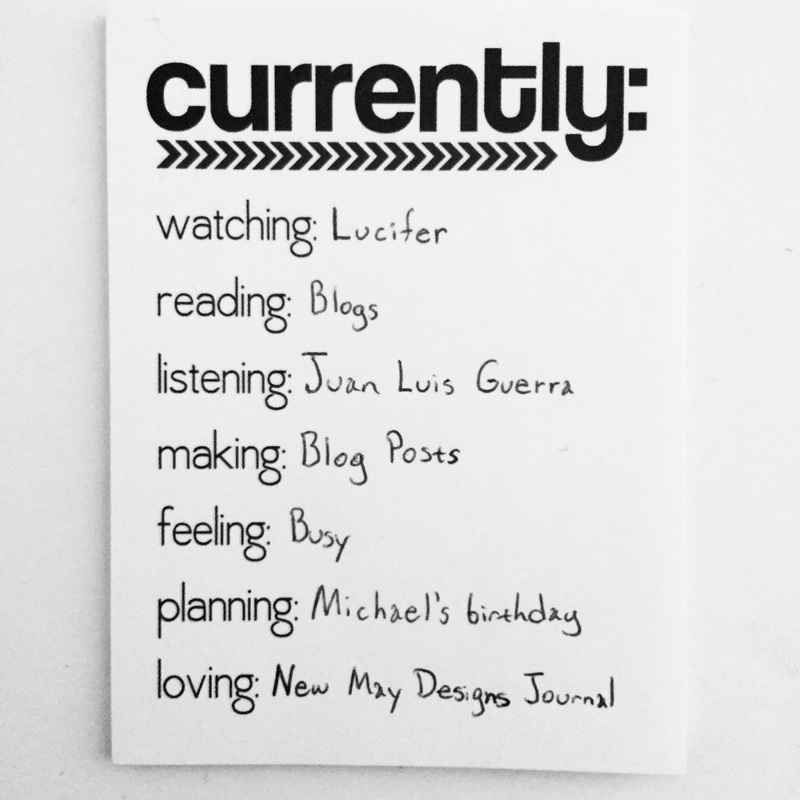 Making: I've been writing a lot of blog posts and lots of lists. I'm also working on some new cards for my shop. Feeling: Today was such a great day. I felt well rested and was able to get a lot of stuff done. 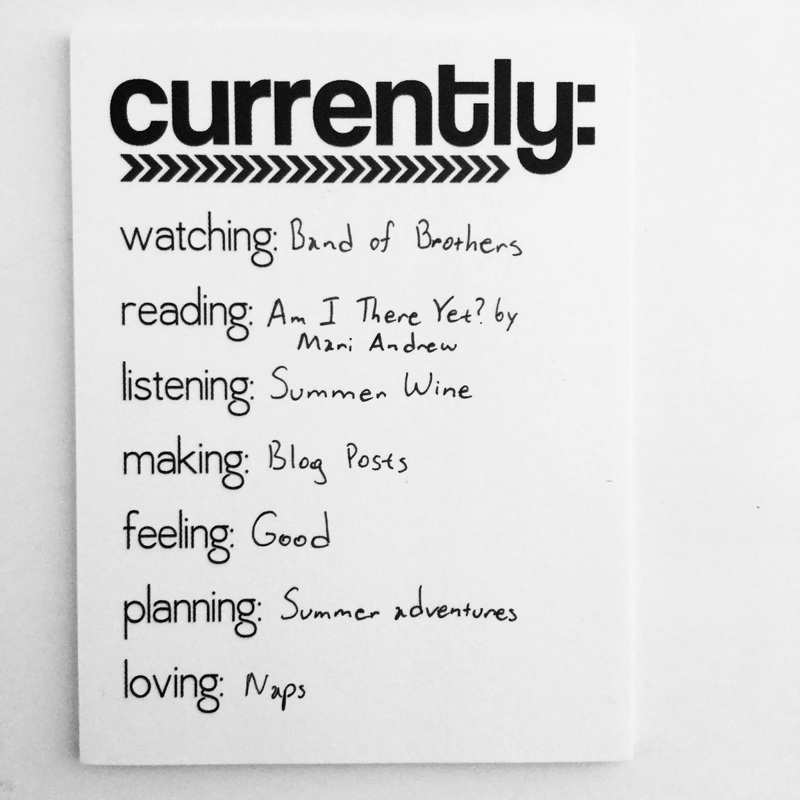 Planning: School is officially over so I've been planning some fun Summer activities. I'm so excited for our summer adventures. I also need to finish making my Summer bucket list. Loving: Naps...I could use all the sleep that I can get right now. It's been a while since I received a voxbox from Influenster so I was really surprised and excited when I received one in the mail. 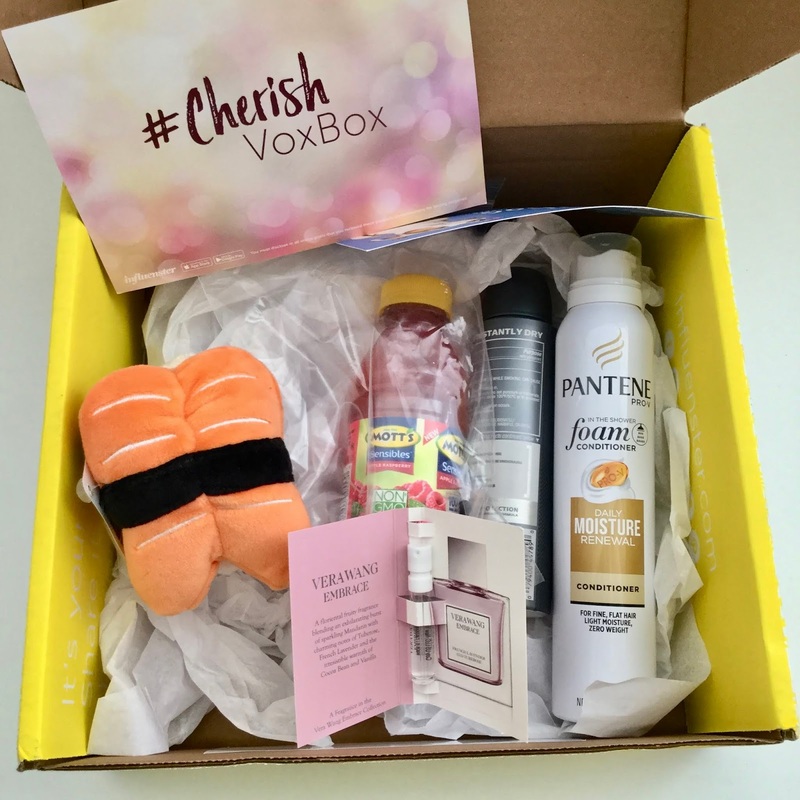 From my experience, if you are selected to receive a voxbox then you will receive an email or a notification that let's you know that you were selected for the campaign as well as information on tracking the package. I didn't receive either so it really was a surprise. I received the Cherish voxbox. This box had several full sized products and items for the entire family. BarkBox Toy: I think this toy is really cute. This dog toy squeaks and is so soft. I don't have a dog so I will be passing this along to one of my friends. Mott's Sensibles Apple Raspberry Juice: I was so excited to receive this juice. There was even a coupon included in the box. There was a discount in the Target Cartwheel app and I was able to combine the coupon with the deal. I ended up getting a six pack of Mott's Sensibles Apple Raspberry juice for just a little over a dollar. The boys and I love this juice and I will be purchasing this juice again. Vera Wang Embrace Fragrances - French Lavender & Tuberose: This perfume smells so good. I plan on carrying this little sample in my diaper bag. Dove Men+Care Stain Defense Antiperspirant Deodorant Dry Spray: This came at the perfect time. John had just ran out of deodorant and I was going to make a run to the store to get him some more deodorant. John said he really likes this deodorant. He loves how easy it is to apply and he really likes the scent. He said that it went on dry and there was no wet feeling. Pantene PRO-V Daily Moisture Renewal Foam Conditioner: I'm already a fan of Pantene so I was so happy to see this. I had no idea that Pantene made a foam conditioner. I haven't tried this yet, but I do love how it smells. Watching: I have always been interested in World War II and I tend to watch a lot of films about war. I wanted to watch Dunkirk as soon as I heard about the film and I was finally able to watch it. I absolutely loved the film. I really loved that there was not a lot of dialogue in the film. I think everyone should watch this movie. Reading: As usual, I've been reading some blog posts. I plan on starting a new book this week, but I'm not sure which book I want to read next. Listening: Te Bote has been stuck in my head for a while. Making: I have so much stuff to get done so I have been making a ton of lists. I'm starting to work on meal planning again so I'm working on my grocery list as well as a list of recipes. Feeling: I'm so exhausted. Everyone says that I need to sleep when the baby sleeps, but that's easier said than done. Planning: I still have several projects to get done. Michael and I are going to work on his school project. I have no idea why his class has a project to get done when school is almost over, but I'm glad that it's a book related project. 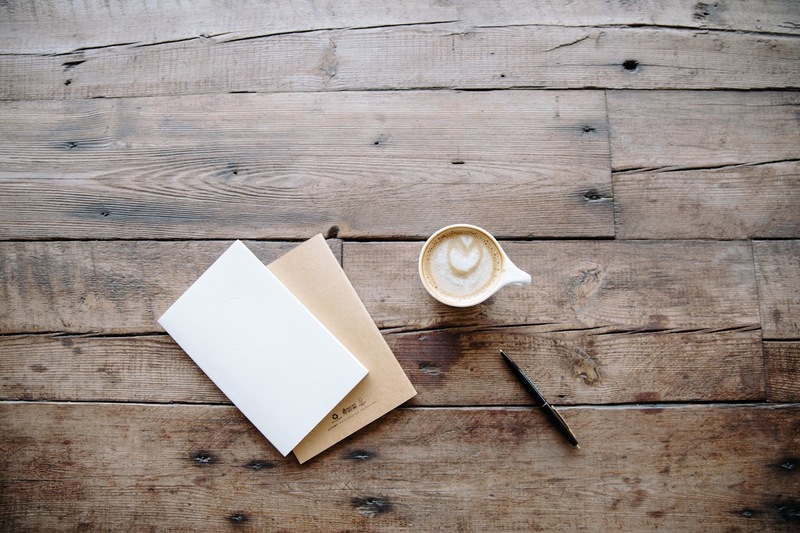 Loving: Holl and Lane has created a new membership, H & L Writes, that promotes writers and the love of writing. This is such an amazing community. 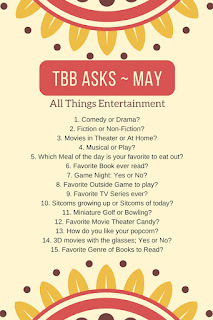 There are monthly themes, prompts, and exercises. Members can also submit a piece to be reviewed by the Sarah (Editor in Chief) or Mia (Editorial Manager). 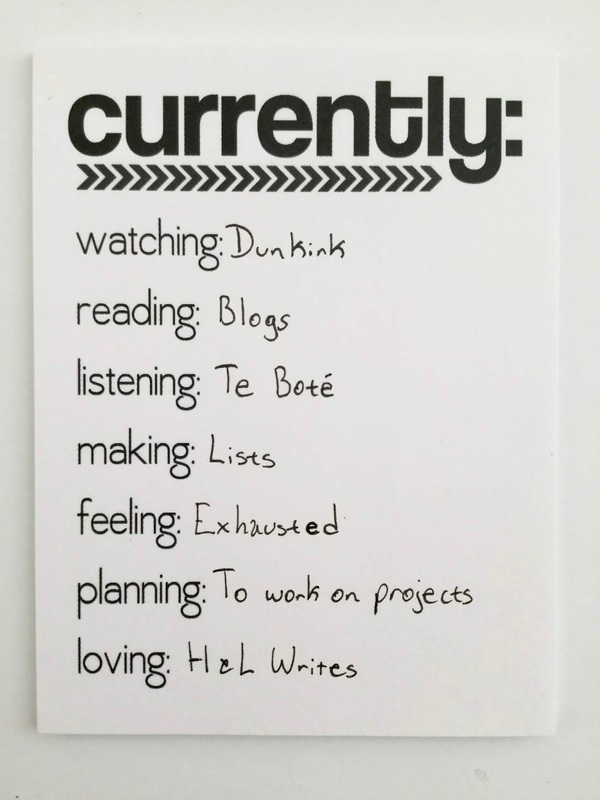 There are so many other benefits to joining H & L Writes. If you would like to learn more about Holl and Lane and their new membership, please click here. Wow a little over a month with our sweet boy has already passed! The past month has been emotional and we are all just feeling so lucky and blessed to have Raphael in our lives. John was able to take 2 weeks off of work to stay with us. My mami has been amazing. She's made us meals and has helped so much. Size: Raphael is slowly gaining weight. At his one month appointment, he weighed 5 lbs and 7 oz so he is now past his birth weight. I'm really happy about this because I was worried about his weight and how much he was eating. His preemie clothes are getting a bit snug and he is starting to fit in his newborn clothes. He is also still wearing newborn diapers. Eating: Raphael is primarily breastfed, but he does take one bottle of fortified breastmilk (breastmilk and formula). He has to take a bottle of fortified breastmilk because he was born early and had some trouble with feeding. However, he is starting to eat a lot more which is great. Sleep: He is doing so much better with sleeping at night. Loves: He loves sleeping on John's chest and he loves laying on me. He loves looking at his brothers. Dislikes: Raphael is not a fan of baths or being cold. He also doesn't like getting his diaper changed. He's already spit up, peed, and pooped on me. His facial expressions are just so cute! He is such a sweet baby. He loves cuddles from John, his brothers, and I. He is strong...it runs in the familia. Raphael makes the cutest sounds and noises. 1. Comedy or Drama? This is a tough one because I like them both. If I had to choose, I'd pick drama. 3. Movies in Theater or At Home? Depends on my mood. If I go to the movie theater, I prefer to watch the movie during the day. 6. Favorite book ever read? The Little Prince by Antoine de Saint-Exupery is one of my favorite books. I also really loved Things We Lost In The Fire by Mariana Enriquez. 8. Favorite outside game to play? I don't really have a favorite, but I love playing Tag with my sons. 9. Favorite TV series ever? This is a tough one. Prison Break and Grey's Anatomy are just two of my favorite TV series. 10. Sitcoms growing up or Sitcoms of today? Sitcoms growing up! 15. 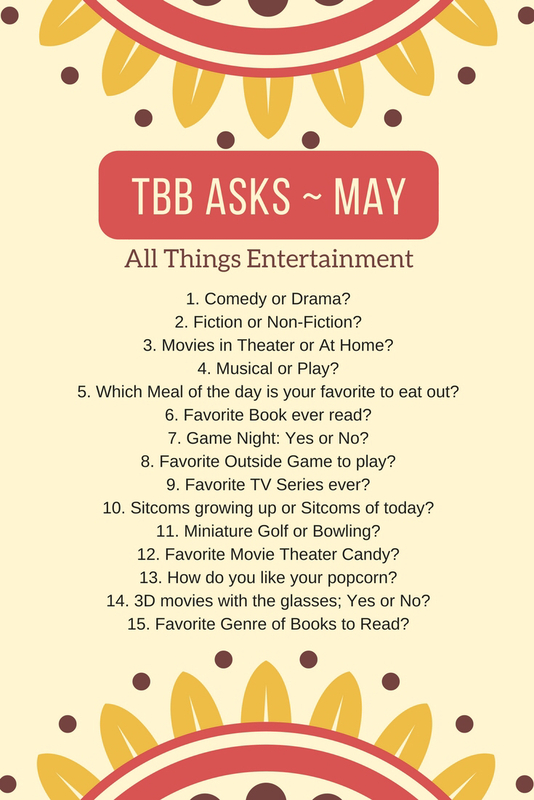 Favorite genre of books to read? Fiction, but lately I've been reading a lot of nonfiction. Another month has gone by! April was a very big, exciting, and busy month for us because Raphael arrived early! We are so grateful that he is here and we have slowly been coming up with a routine. 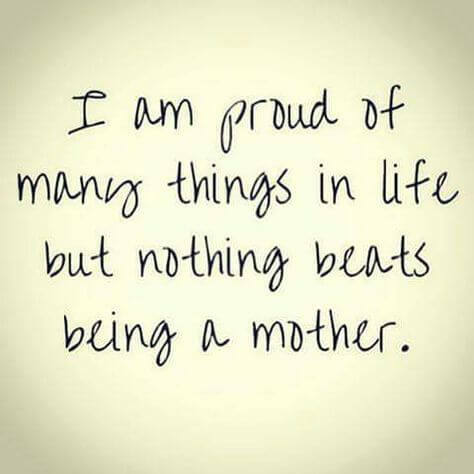 A lot of things got pushed back due to my little one's early arrival, but I thought it would be great to remember the goals that I was able to accomplish. After reviewing my goals for April, I realized that I did so much in April even though I may not have accomplished all of my monthly goals. 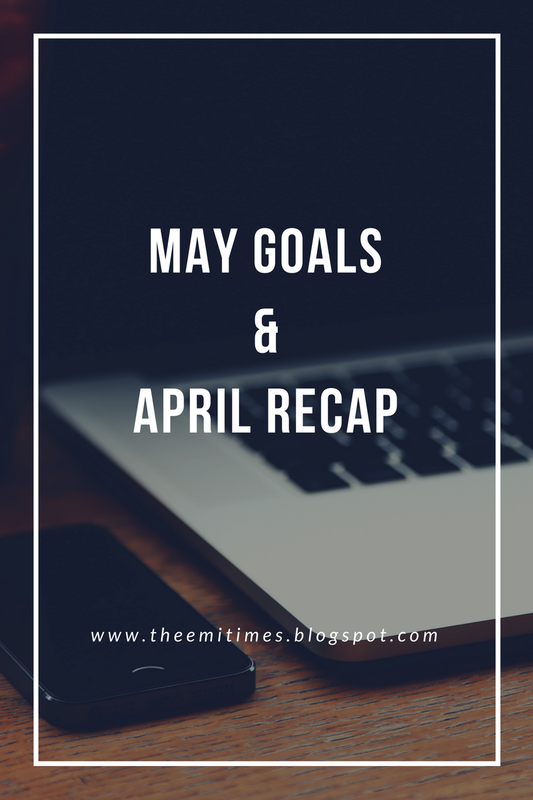 Before we get to my new goals for May, let's check out my recap of my goals for April. Read 1 book: Unfortunately, I did not finish reading a book. I did read a few blogs and articles. Declutter every room and closet: We actually decluttered most of the house before Raphael was born. I think we only had one room to declutter which was done after his arrival, but at least it was completed in April. Work on meal plan: I did not work on my meal plan. I barely cooked anything after I gave birth to Raphael. Luckily, my mami made us lots of meals. Make at least 2 scrapbook/craft projects: I didn't make any projects. Well...I guess you can count journaling right? Finish shopping for the baby: Technically we did finish shopping for Raphael. We bought all of the important stuff as well as the necessities, but we did have to buy a couple of things like some preemie clothing. The newborn clothes were too big for Raphael. Happy Wednesday! It's time for another Currently List! Watching: This season of Lucifer is so good! Hopefully, the show gets renewed for a fourth season. 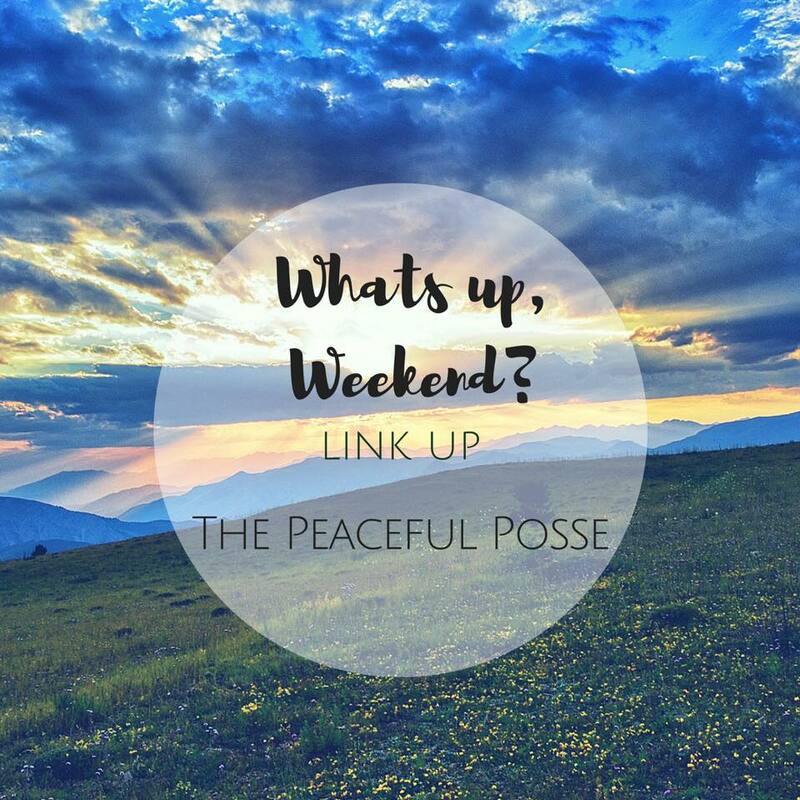 Reading: As usual, I'm reading blogs. I'm still trying to decide which book I want to read next. What are you currently reading? Any book recommendations? Listening: I've been listening to a lot of music by Juan Luis Guerra. His songs are amazing! One of my favorite songs is A Pedir Su Mano. You can check out the song here. Making: I've been working on a few blog posts. Feeling: I've been so busy. We are still slowly coming up with a routine so I'm very happy about that. I've also started using my planner again and am starting to feel more organized. Even though I've been busy, my planner has definitely helped me remember a lot of stuff. Planning: I cannot believe that Michael is turning 8 years old. Time really does fly by. I'm so excited to pick up his birthday present and cake. I think I may even make him a homemade cake as well. Loving: I received my new May Designs Newborn Journal and I absolutely love it! It has been so useful and I highly recommend it. I love memes especially the funny ones. I have found so many new parenting memes that I love. 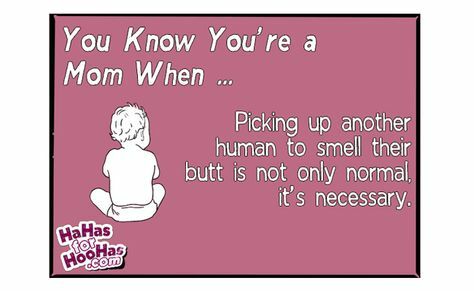 Now that I have a newborn again, I thought it'd be fun to share a few of my favorite memes. I even included a few that made me remember when my older sons were toddlers. Check out the memes below. I love this meme so much! 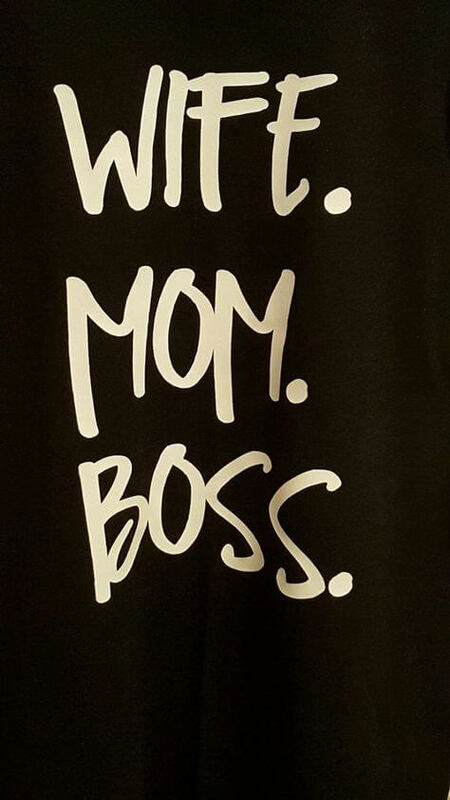 I think I might have to write this down in my journal or frame this near my craft/work area. This meme has always been one of my favorite parenting memes. I have done this so many times. In fact, I did this yesterday while I was talking to my mami. 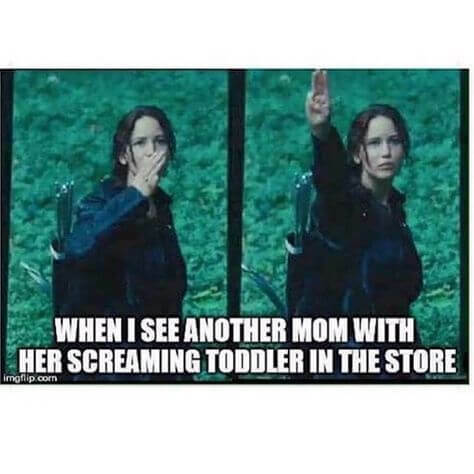 I always feel bad when I see a mom or dad with a screaming baby or toddler in the store. I definitely know how it feels. I'm also that person that will defend parents from people who has something to say about a baby or toddler screaming in the store. 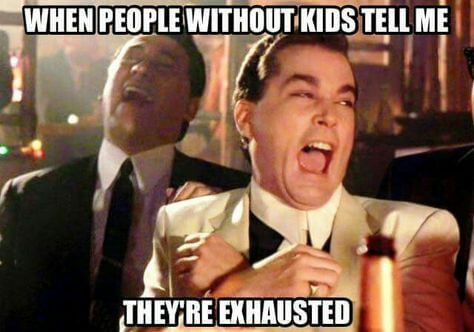 Seriously, no one wants to hear a kid screaming...especially the parents. Give the parents a break and understand that babies and toddlers will scream and cry...sometimes for the most random reason. 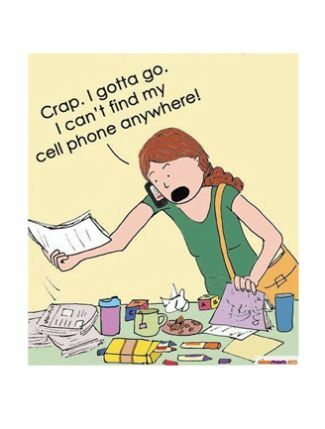 I have also done this so many times. 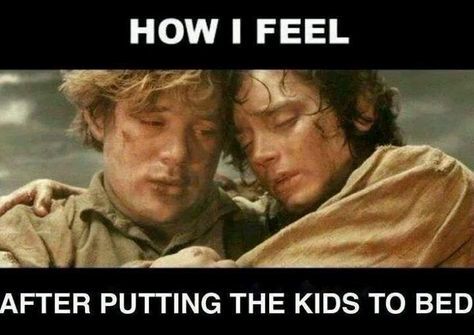 I'm always exhausted after putting my boys to bed. Then I have to decide whether to go to sleep or try to catch up on a show or two. Usually, I end up choosing to go to sleep. 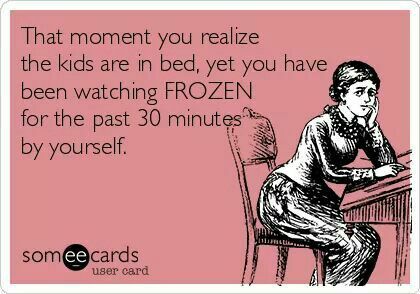 This is also something that I have done several times especially when Michael and Gabriel were younger...except it wasn't Frozen that I was watching...it was Jake and the Never Land Pirates. Yes! Yes! Yes! This is so important! 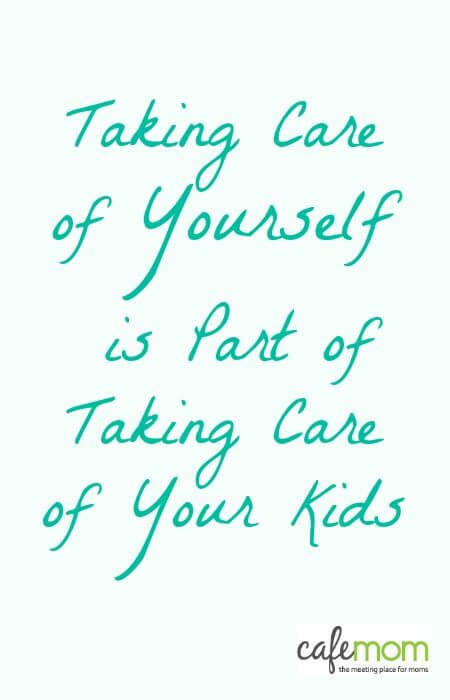 So many people don't realize that you have to take care of yourself in order to take care of your kids.